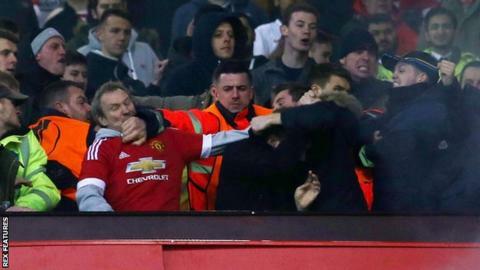 Manchester United and Liverpool have been charged by Uefa following crowd trouble during the Europa League last-16 second leg at Old Trafford. Rival fans were seen fighting in the stands, seats were thrown and flares were lit at Thursday's 1-1 draw, during which five men were arrested. Liverpool, who won 3-1 on aggregate, have been charged with illicit chants and the setting off of fireworks. The case will be heard by Uefa's control, ethics and disciplinary body on 19 May, the day after the Europa League final in Basel. Radio 5 live commentary: "Uefa will take action, mark my words"
Greater Manchester Police superintendent Jim Liggett said the force was investigating a "handful of concerning incidents" after Thursday's game. Beforehand, police had to remove a banner on the M602 motorway in Salford designed to taunt Liverpool fans heading to Old Trafford. United were not punished by Uefa after some of their fans sang offensive Hillsborough disaster chants during the first leg at Anfield. Liverpool, meanwhile, are looking into a tweet sent from youth team player Jordan Williams' verified Twitter account during the game. Other Twitter users suggested Williams was mocking the 1958 Munich air disaster, in which eight United players died. Williams, 20, deleted the tweet and later apologised, saying: "My Twitter has been hacked, I would never put anything like that to offend anyone, sorry about this." His account has since been deactivated.